I’ve been obsessively watching Fender Coronado guitars on eBay for years, dreaming of the day that I might own one of the hollow body beasts. I’ve always been a fan of Fender guitars (strats, not teles), but there’s something even more magical about the Coronado. Even the original single pickup model is a marvel, and the Coronado II and Coronado Bass. But when I came across a Coronado XII on the auction block – and at an unfathomably affordable price – I put in a bid. Just a test bid. A joke bid. I figured the current price was so low that there was no way my humble bid would the higher than the current max. But it was. Then I figured that there was so much time left on the auction that I would surely be outbid before the time was up. But I wasn’t. When I finally got the guitar, I played a few chords and it sounded lovely. Then I played some bar chords higher up the neck and it sounded lousy. And I plugged it in and some of the strings were much louder than the others. So I took it to the best guitar repair shop in Chicago, the Shake Shop. Tom took some time to get the neck properly set, and took good care of it. And now it sounds fantastic. Way better. Nearly new. 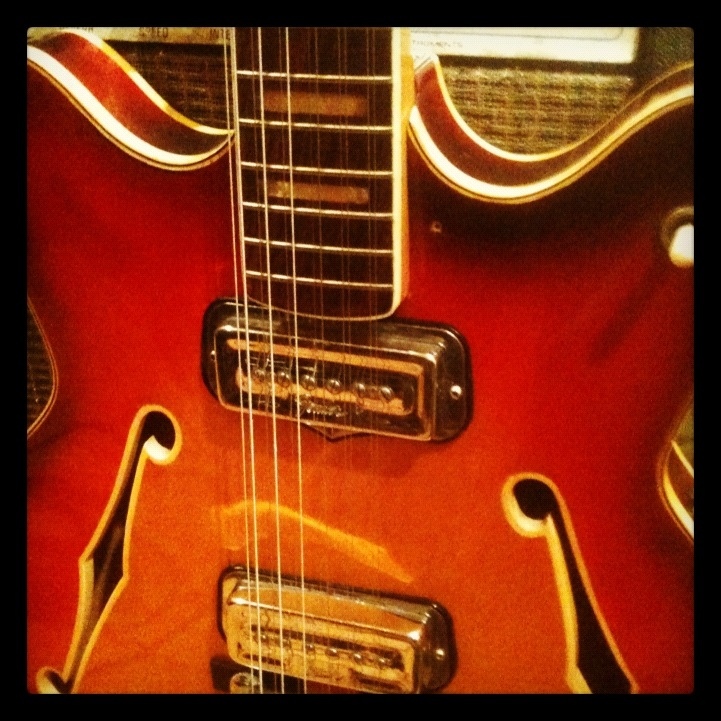 The Coronado XII has a full, chimey sound that will be featured all over Slushy’s singles in 2012. Get ready! So that’s my new guitar. You can hear it on “All The Rad Dudes,” “Five Little Leaves” and “Hello, We’re the Lemons”.